For the record, I only return to maybe 20% of new areas I explore. Some have nothing; others just a few things on the first hit, then obviously downhill from there for various reasons. It takes discipline to explore, especially when you know another site is guaranteed to give up more of the same old stuff. Exploring may not pay off today, but over time generally does. It took him 16 years to find the Atocha! Very nice. i'd be happy with that lot. A few nice teeth are better than none. Go out everyday like Mel Fisher and "say today's the day"! While walking out, our friend Jean-Louis spotted this killer Porpoceras, and handed it to my wife. I was afraid to mess it up with aggressive prep, so I saved it for last, when I'd hopefully be at the top of my prep game for material from Belmont. We like it. Kem Kem bone - What is this? Indeed, which is why the statement of "nobody really cares" is inaccurate. However, it would not be the first -- and doubtfully the last -- time politics interferes with science. The underlying Aalenian layer was equally as impressive, if not more so. Ammonites could be found loose as well as in blocks studded with belemnites. Here are some loose ones my wife found. Last 2 pics are forward and reverse of a double. They are bringing politics into science. Uncalled for and an insult to the scientific community worldwide. One of our favorite spots in France was the Lafarge Quarry at Belmont, near Lyon. Insanely productive. There were at least 100 collectors there that morning, many "in the know" showing up with wagons. We only had about 4 hours to collect, but everyone was finding ammonites, gastropods, bivalves, and belemnites hand over fist for the entire time, even walking out. First, let's look at what my wife found in the overlying Toarcian layer. First 2 pics are forward and reverse of the same specimen. Jack, I don't know if you got your answer but I purchased similar osteoderms. They were found in N. Florida, Pleistocene and he said they were Holmesina Septentrionalis, not Glytodon. Here is the pic. Well, obviously some people do care, such as those in the scientific community who oppose the politicization that goes with these name changes, Armenians, and the OP. Next, the Wolfgang Endress Quarry in Gräfenberg, Germany. Wife kinda smoked me at this quarry. I'm looking forward to seeing everyone there! Counting the days... One thing I'm planning to bring is a small dropper-bottle of water/glue mixture for stabilizing the more delicate brachiopods. I've noticed that there are a lot of single-valve brachiopod specimens there, and it's sadly common for me to pick up a rock, notice a bunch of brachs, turn it over, and watch as the brachs drop off, leaving endocasts. This time, I want to be able to stick them down! If anyone wants to borrow the bottle, feel free to ask. 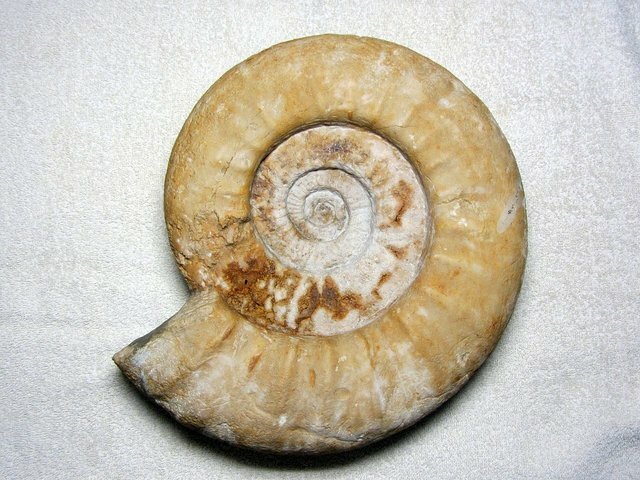 The overwhelming majority of this Ammonite fauna is preserved as limestone molds. But they can nevertheless make very pretty pets. There is a seemingly unendless amount of sites which can be visited since a great expanse of these layers is exposed from the north of Switzerland over the Swabian Alb up into the Franconian Alb in Bavaria. The forms and variations of this fauna are also manifold and the species and genera are being continually moved about or renamed, so I can't guarantee that my IDs are up-to-date. I have found the kids know their dinosaurs. Shows like Walking with Dinosaurs, video games, and google have created a generation of really dinosaur wise kids. This presents a challenge for us. We need make sure that we can present dinosaurs they do not know about and that we can always give them a few strange ones to bend their brains. Leptoceratops fits that very well but had been pretty far down the acquisition list. i had an opportunity to grab one so I did. I am really looking forward to this arriving and getting use in the classrooms. I suspect that kids will really dig this small and strange but oddly cute Ceratopsian. A good get for us I think.
. . . . . . . and because Turkey is calling them something else changes what? Does the rest of the world care? They can call them whatever they want -- nobody really cares. If they discover new coprolites in Turkey will they name them after Turkey? "What is the average air speed of an unladen African swallow?" is a better question. Vic, at the bottom of the original post there is a link. Put your Forum name in where it says "write your next task" and click "save it". That should put you in the queue at the top of the list. Participants are going on from the bottom up.